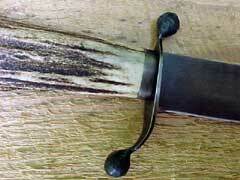 Custom knives seem to be very popular these days. At many large gun shows, it appears that there are as many knives as guns; maybe more. 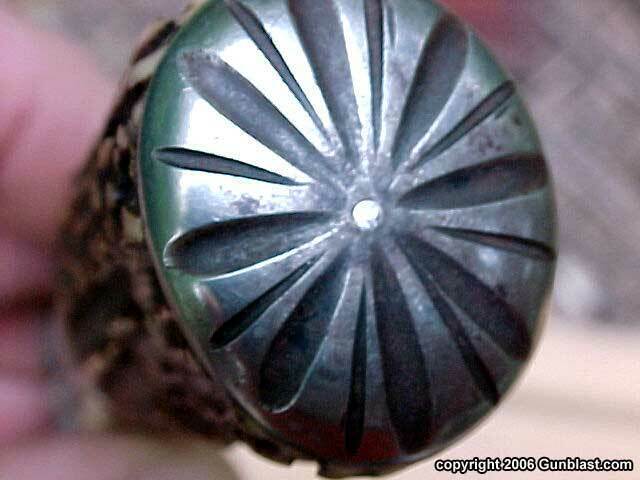 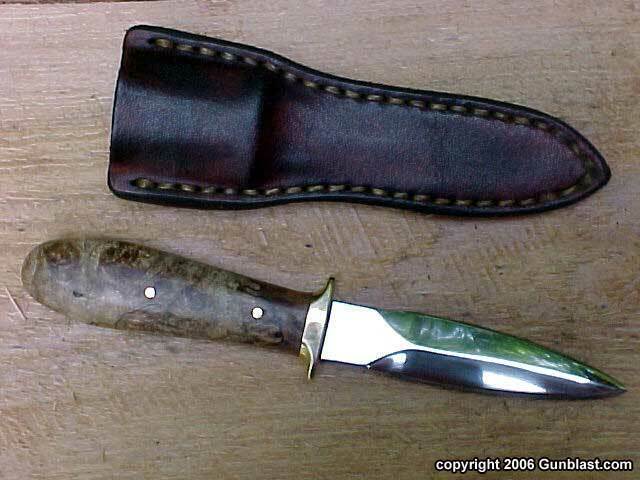 However, many custom knife makers are better described as custom knife assemblers. 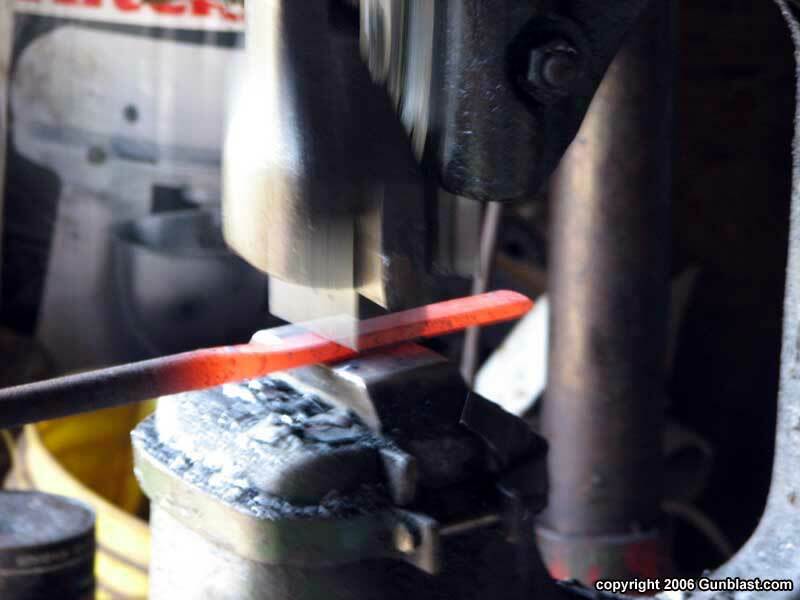 They buy knife blanks and handle blanks, assemble the two with a bit of polishing and sharpening, and call the product a custom knife. 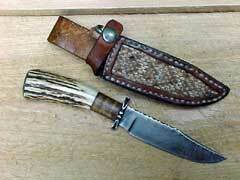 Then there are knife craftsmen like Scott Black of Picayune, Mississippi. 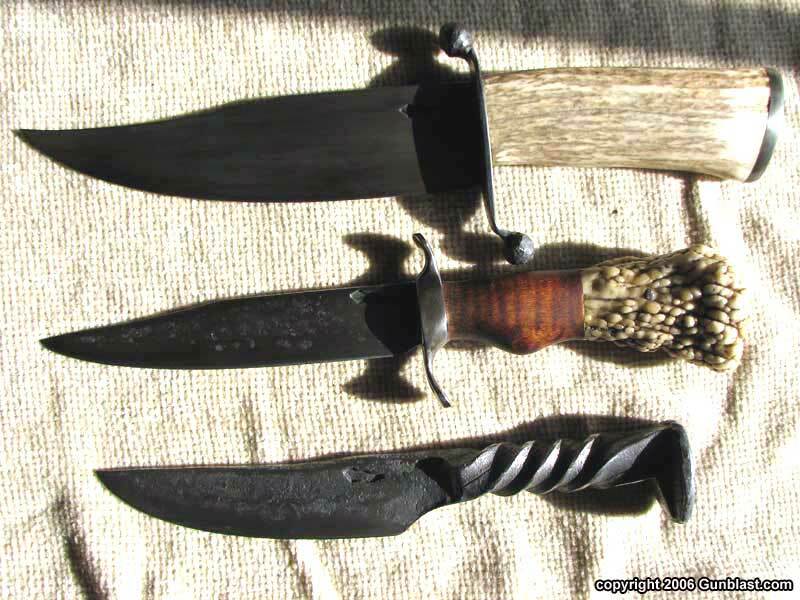 Scott runs a one-man knife shop called Copperhead Forge. I met Scott’s knives before meeting Scott. 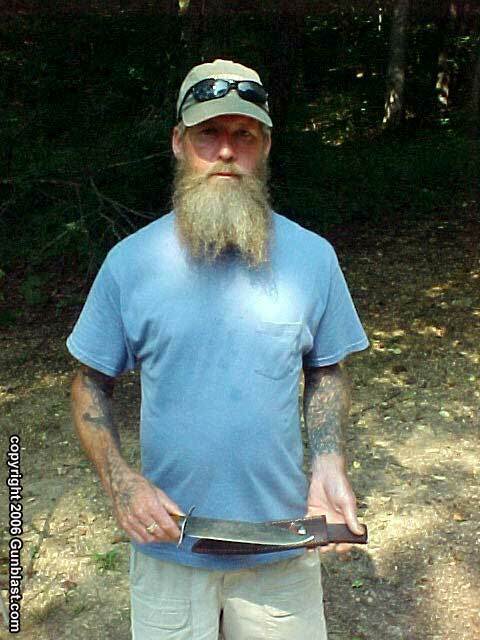 My cousin Melvin showed up with one of Scott’s drop-dead gorgeous hand forged knives a couple of years ago. Since that time I have seen a few others, and all have been as impressive as the first. 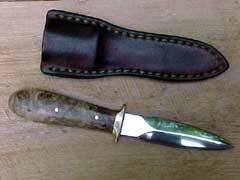 Scott makes both folding and fixed blade knives, along with hatchets and such if the customer desires. 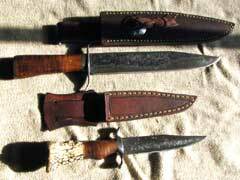 Each blade is hand-forged, one at a time, and Scott also makes his own leather scabbards, custom fitted to each knife. His blades are made from either 5160 or 52100 carbon steel alloys. 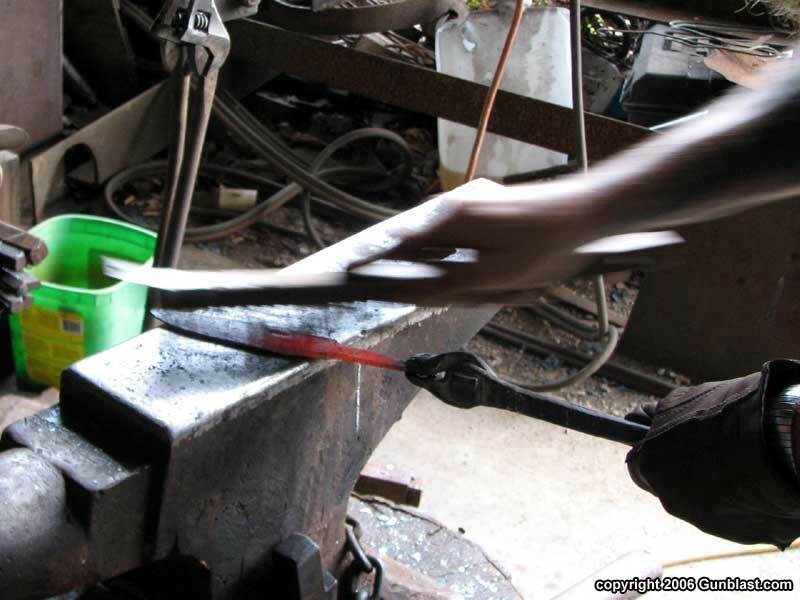 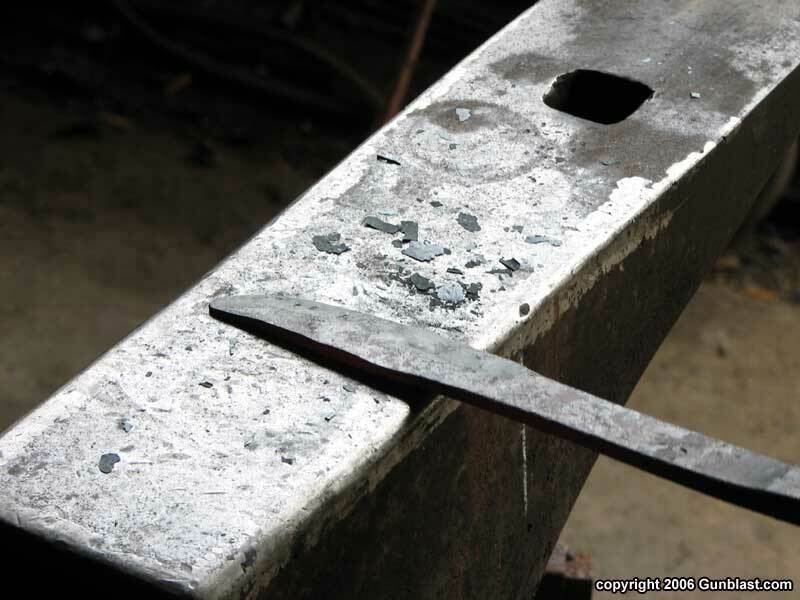 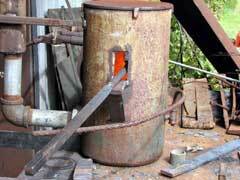 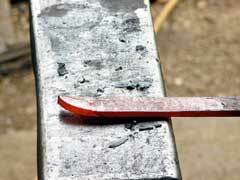 In addition to these steels, Scott also forges his own Damascus blades from multiple layers of steel, along with blades made from steel wire cable, heated in his forge and pounded into shape. 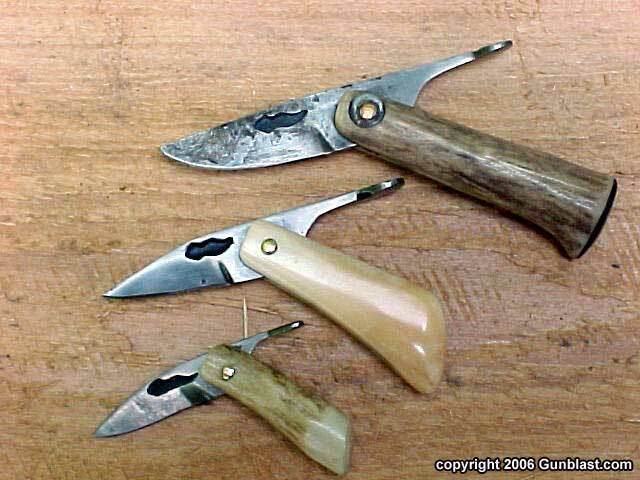 Everything that he makes is high-quality blade-grade stuff, and his handles are made from natural materials such as buffalo horn, whitetail antler, and natural woods. 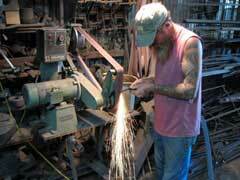 I recently got to meet Scott Black in person for the first time, but both his work and his reputation as a craftsman and all-around good guy had preceded him. 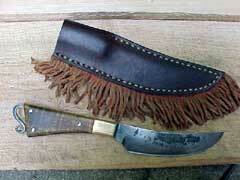 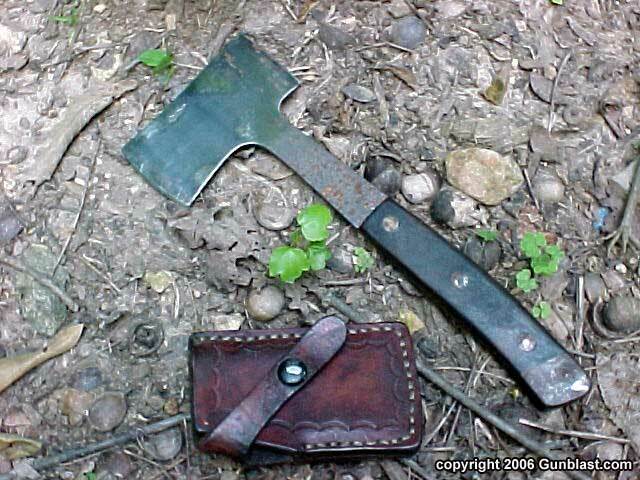 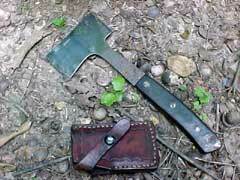 At the time I was introduced to Scott, cousin Melvin presented me with my own Copperhead Forge knife. 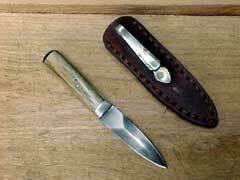 He wanted to buy one for me, and being a good younger cousin, I put up no argument. 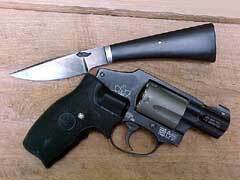 It is shown here in the photographs along with my air weight Smith & Wesson thirty-eight for size comparison. I have been looking for a similar knife for a long time. 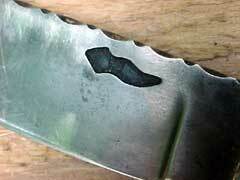 I like about a three-inch edge, but a full-sized handle. With most makers, a small blade gets you a small handle. To get a large handle, you get a longer blade. This knife is just right. 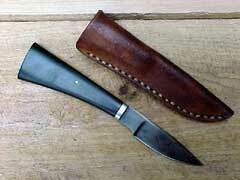 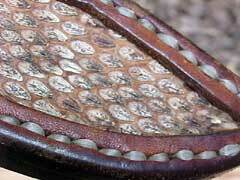 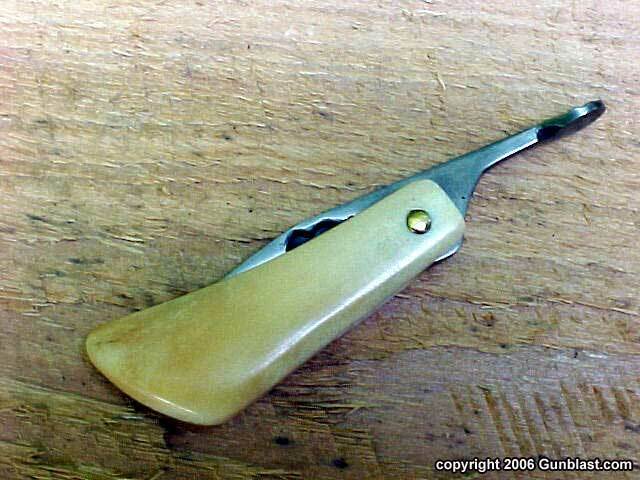 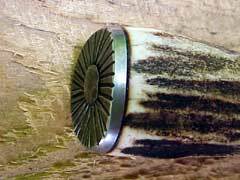 It has a hand-filling handle made of buffalo horn, and a sturdy carbon steel blade that is tapered in thickness. 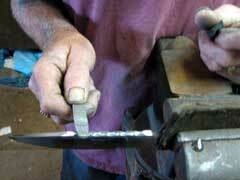 I like a knife to use for cutting, not as a pry bar or hammer. 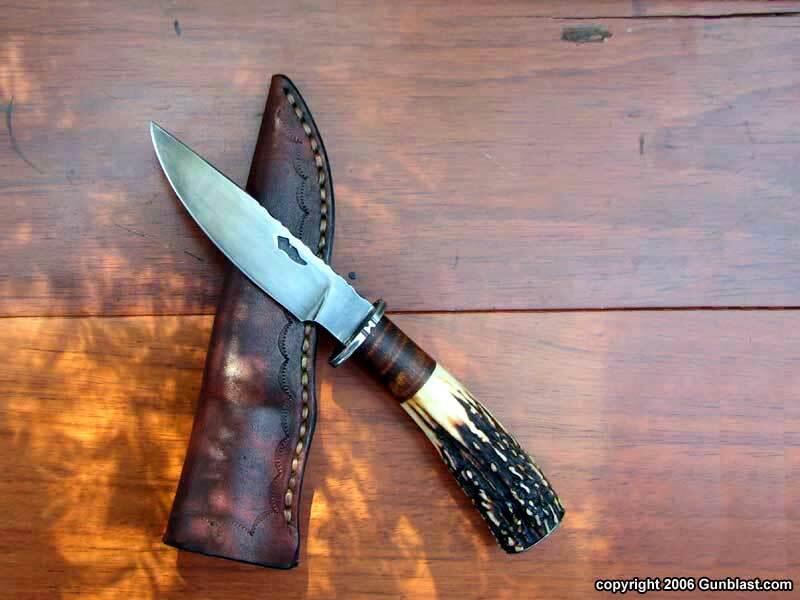 This knife has a blade made for cutting; not too thick, but with enough thickness in the spine for rigidity, flat ground to a razor edge, beautifully finished, with Scott’s trademark copperhead cut into the left side. 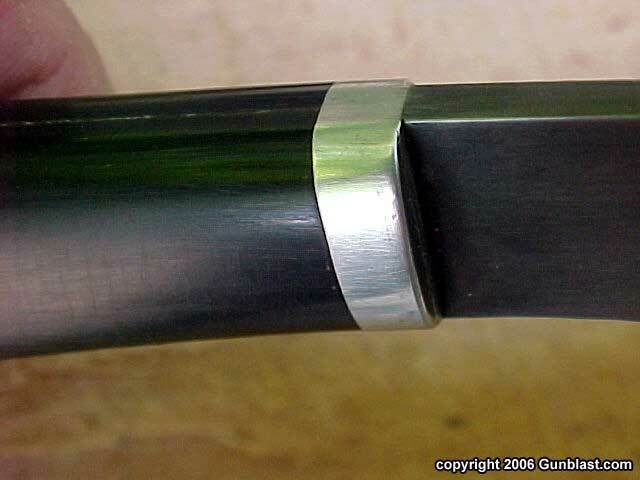 The blade has a slight drop point of three inches, with a three-quarter inch choil section, and a hand-poured (by Scott Black) pewter spacer. The edge has just enough belly to make it a very good all-purpose blade, and it will ride on my belt everyday. 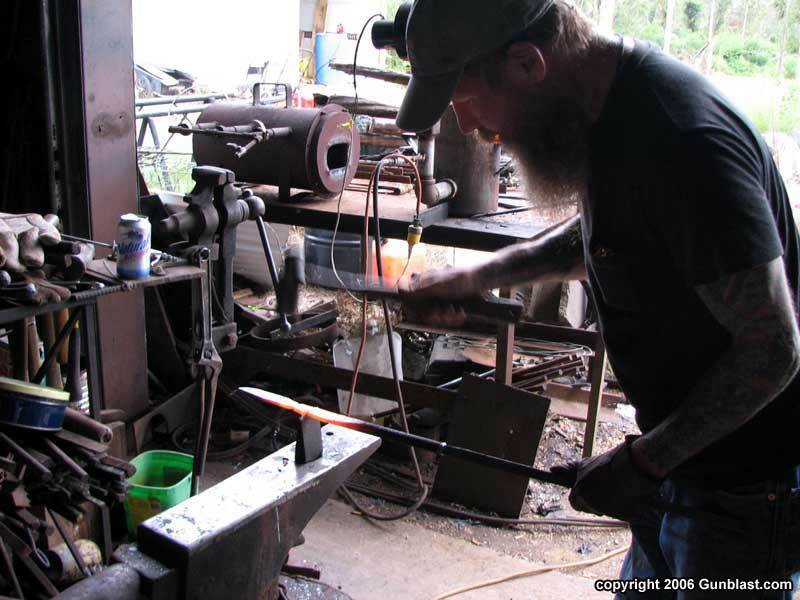 Scott does not merely assemble these knives, he creates them, and the quality of his craftsmanship is evident in every knife that bears the Copperhead Forge trademark. Unlike many knife makers, Scott doesn’t have a few select styles from which to choose. 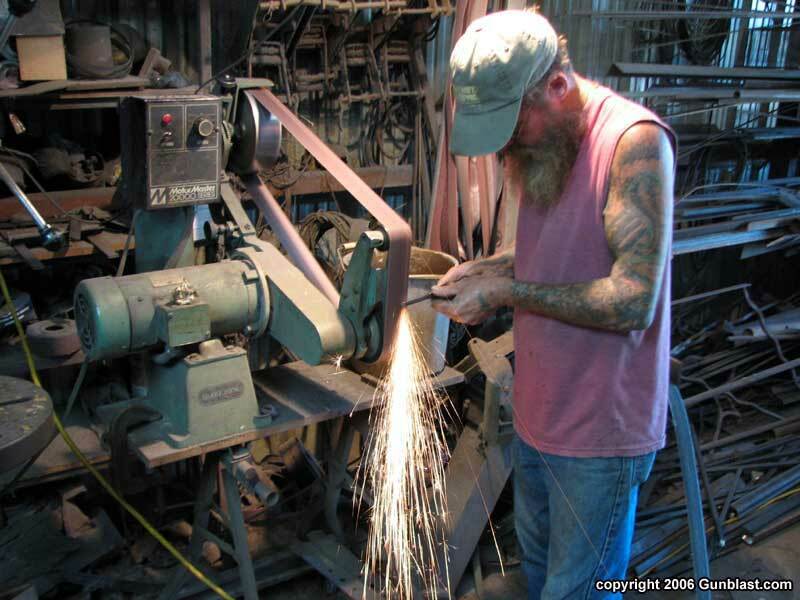 He will make what the customer wants. This is the difference between a semi-custom knife and a true custom work of art. 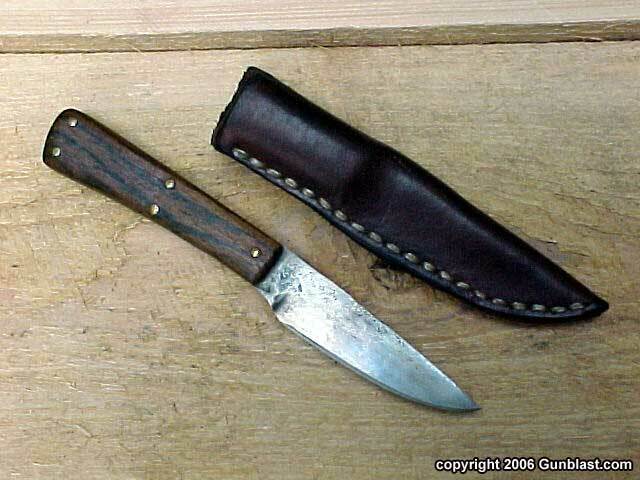 I’ve owned a lot of knives, and still have several. 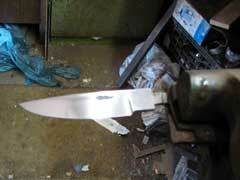 Most are good production knives such as a few by Cold Steel and Kershaw. 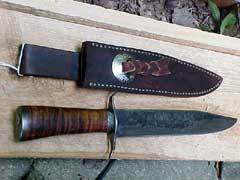 I also have a decent semi-custom knife that I bought in Tulsa last year. 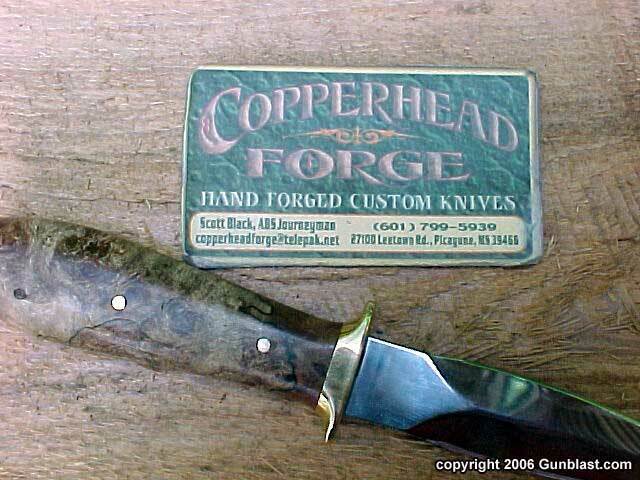 However, this Copperhead Forge blade is the finest that I have ever owned, and I highly recommend the work of Scott Black. If you have an idea for that blade that you have always wanted, give Scott a call. 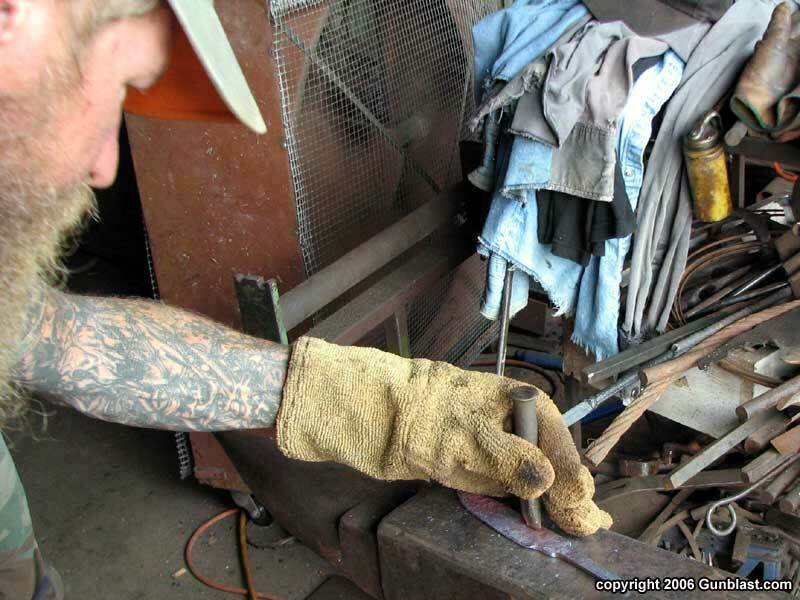 His work is first-rate, and his prices are very reasonable. 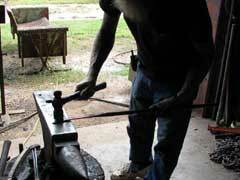 Contact Scott by email at: copperheadforge@bellsouth.net or by telephone at: 601-799-5939. 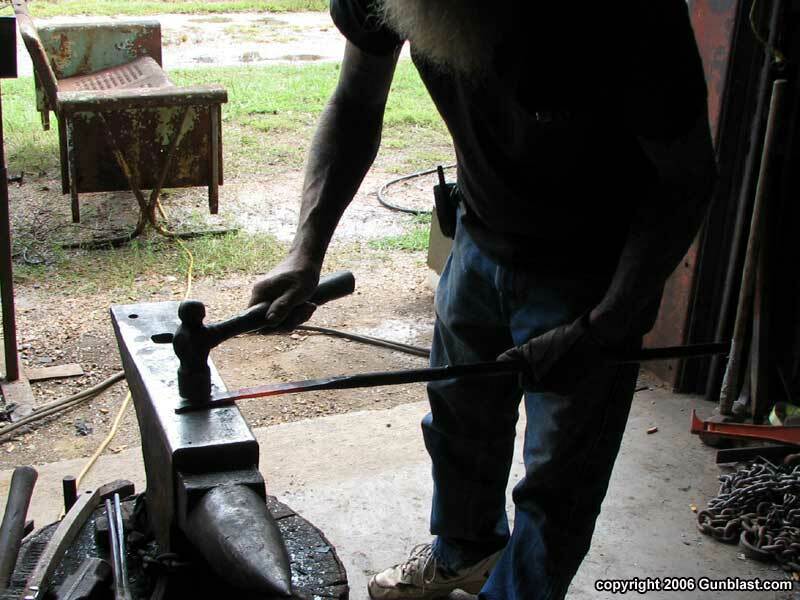 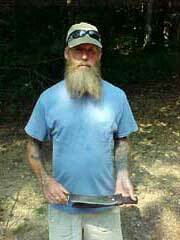 Recently, Cousin Melvin went to Picayune, MS and had Scott Black make another custom knife for him. 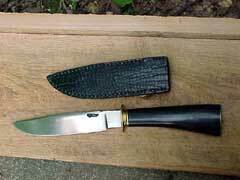 Cousin Melvin was the first to turn us on to Scott's work, and already owns several of Scott's fine knives. 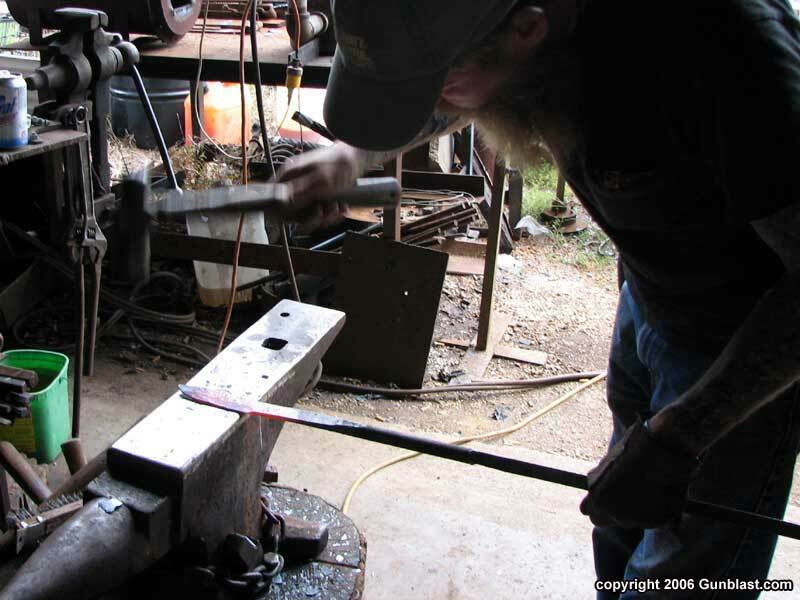 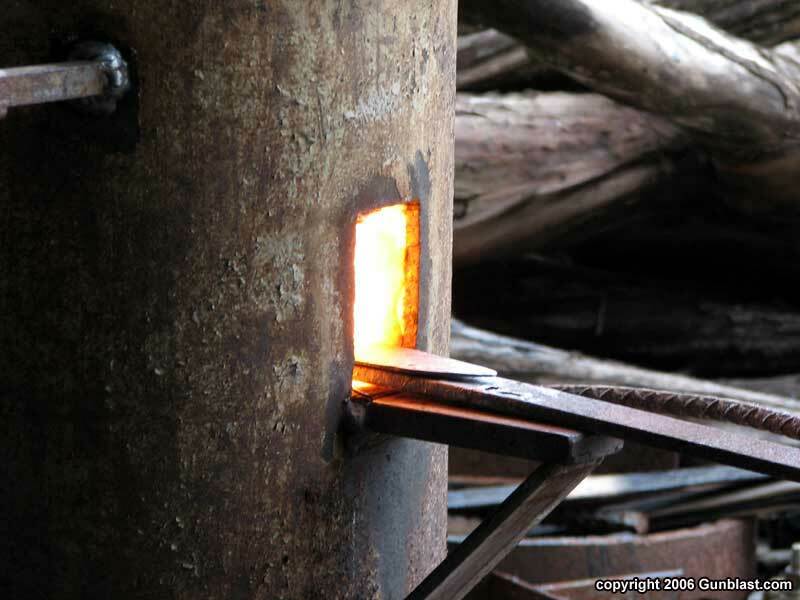 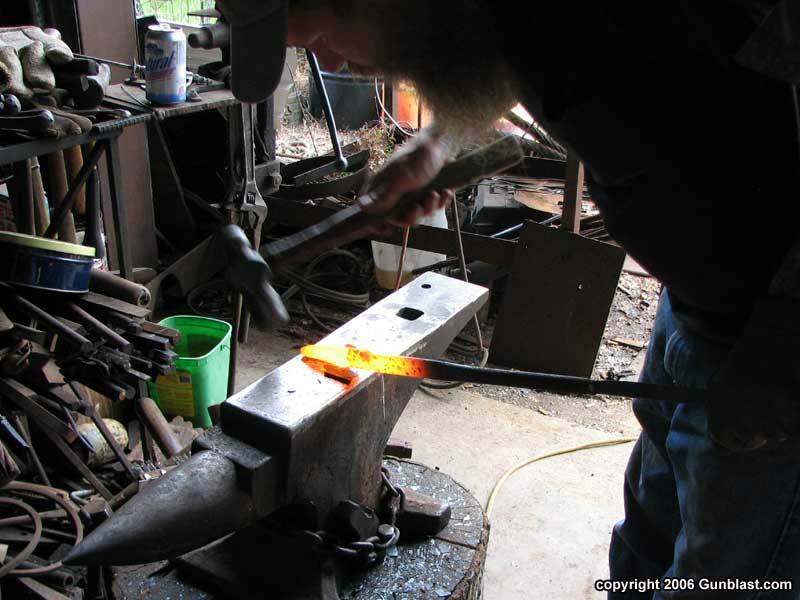 Melvin took his digital camera along, and captured Scott's progress in hand-forging his new knife. 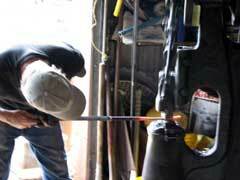 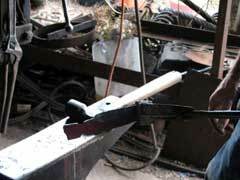 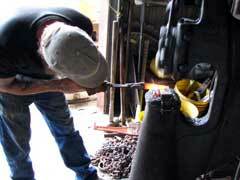 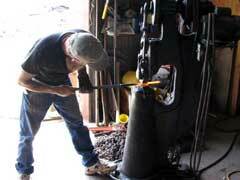 Scott begins with bar stock, and uses a forge of his own design & fabrication. 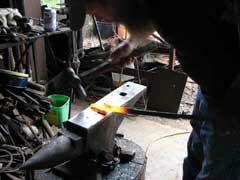 All blades are hand-forged by Scott Black. 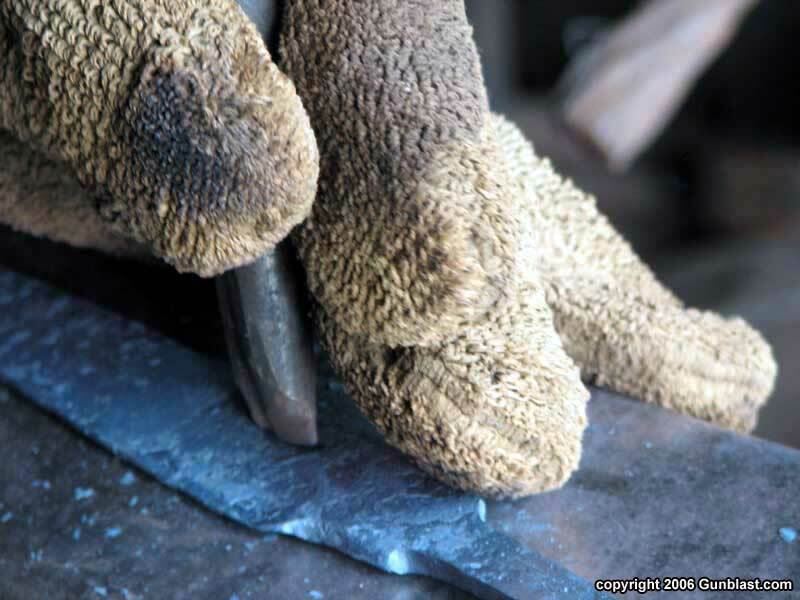 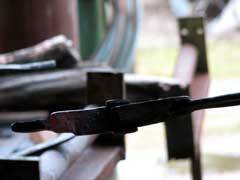 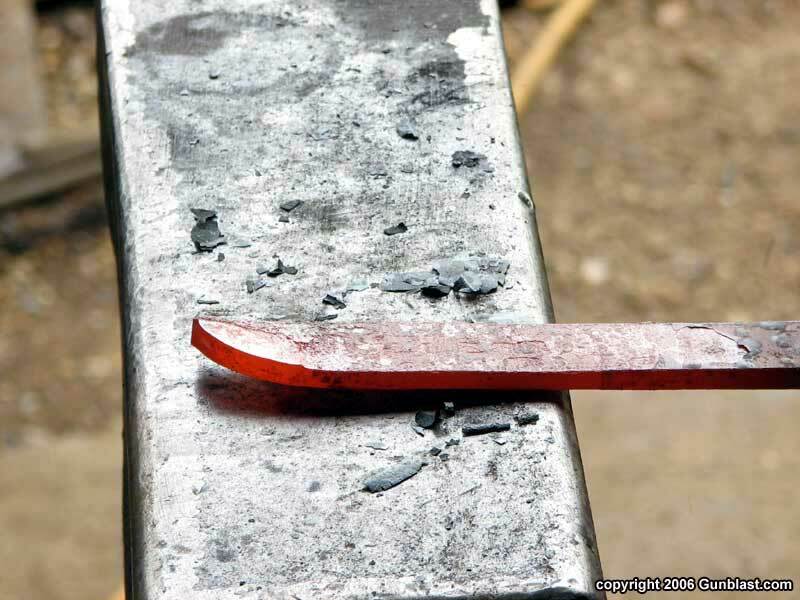 Blades are hammered to rough thickness on a power hammer. 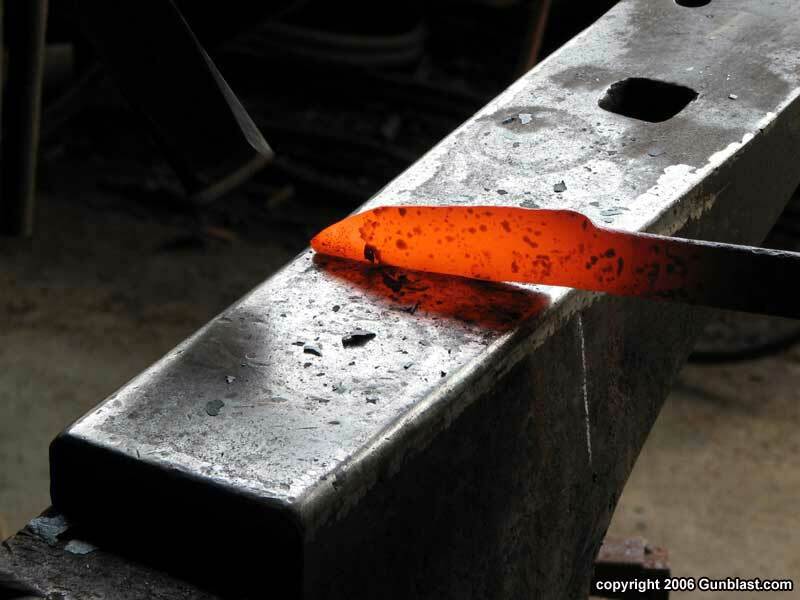 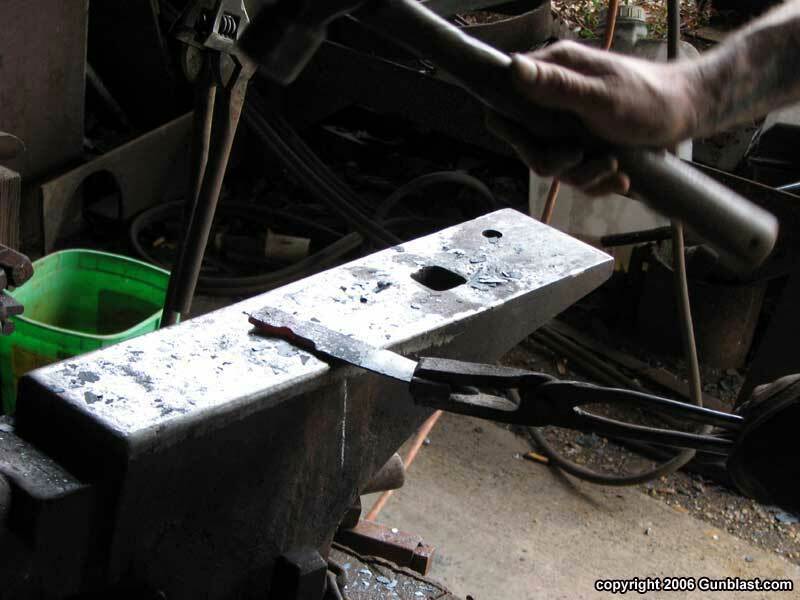 The blade begins to take shape on the anvil. Scott hammer-forges all blades by hand. There is no substitute for the hand of a Master Craftsman. 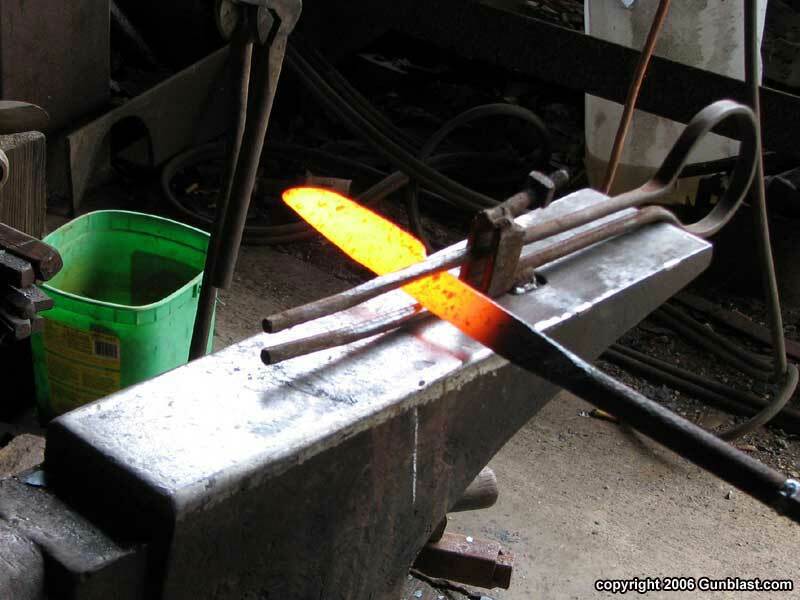 Each blade is a unique, one-of-a-kind creation. 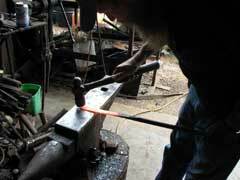 After the blade is roughed to shape, Scott cuts the tang to length. Scott hammer-forges the tang to shape by hand. 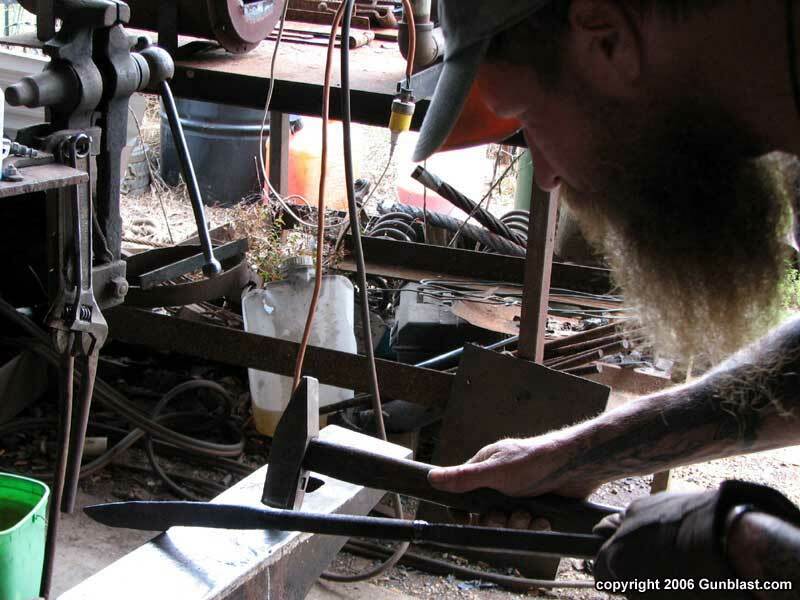 Scott punches his Copperhead Forge trademark into the blade. 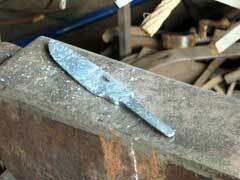 The steel has been roughed into shape. 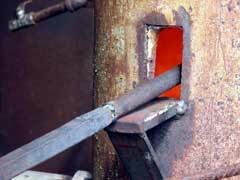 The finishing process begins by hand-scaling the steel. Finish shaping, like all other aspects of Scott's operation, is done by hand in the traditional manner. 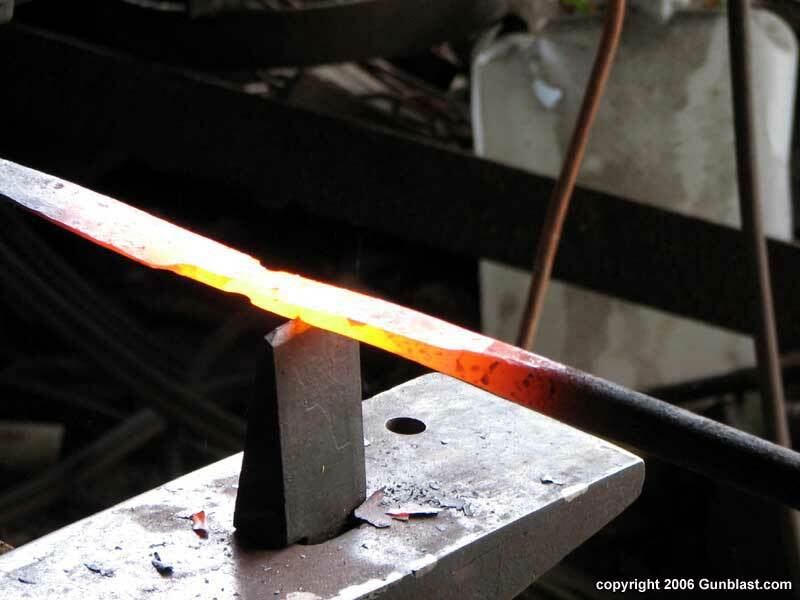 Hand-forging and hand-finishing is largely out of fashion in today's world, but the final product is worth the extra effort. 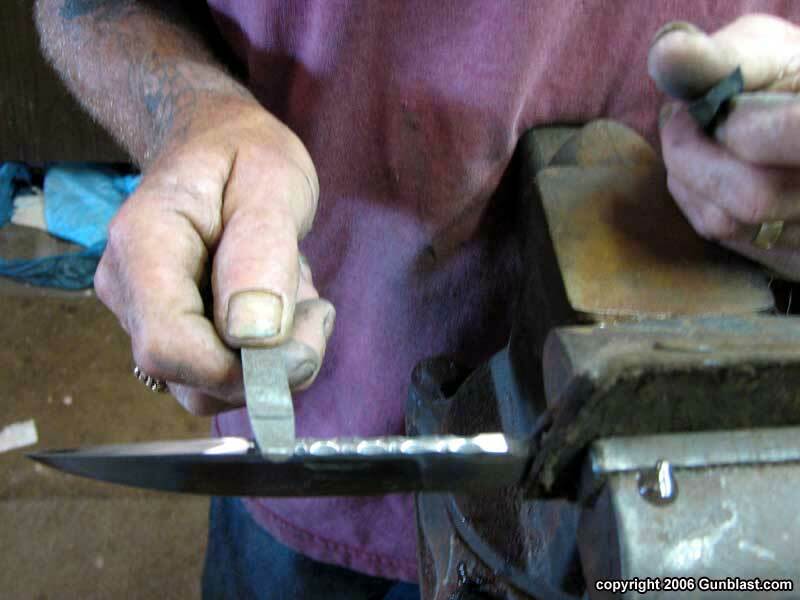 Scott hand-files the scallops in the blade spine. 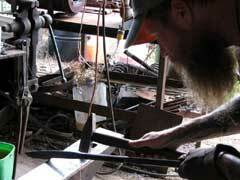 Scott puts the final edge on the blade. The finished product. 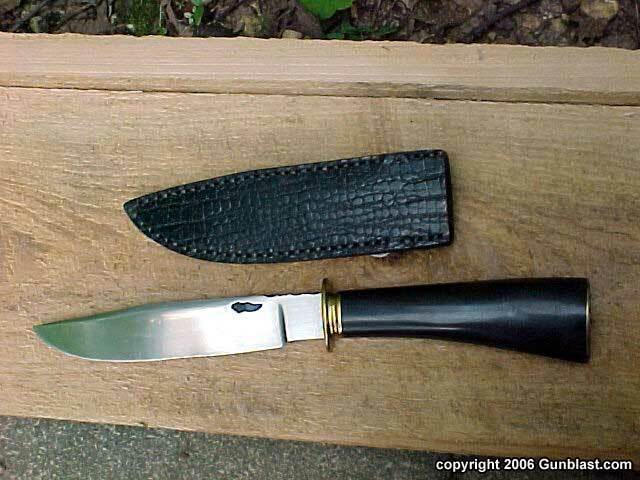 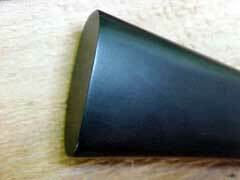 All components, including the sheath, are hand-made by Scott Black. ...including Scott's version of a "Railroad Spike" knife (bottom). 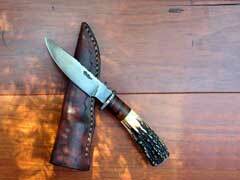 Scott Black of Copperhead Forge creates some of the finest hand-made custom knives available. Author's own Copperhead Forge drop point knife. 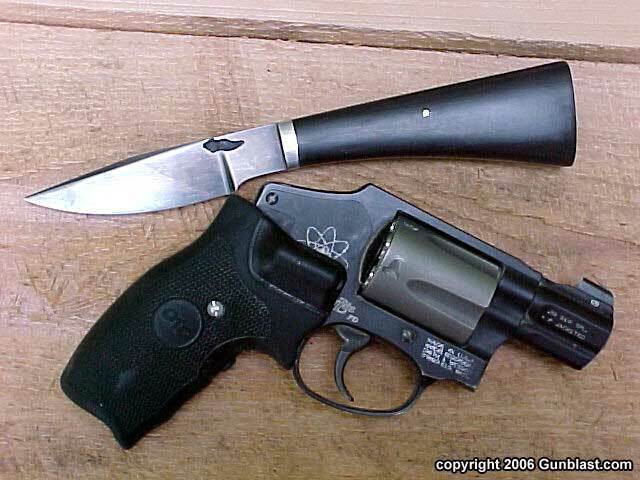 Bottom picture shows the knife's handy size along with Jeff's S&W 342PD. 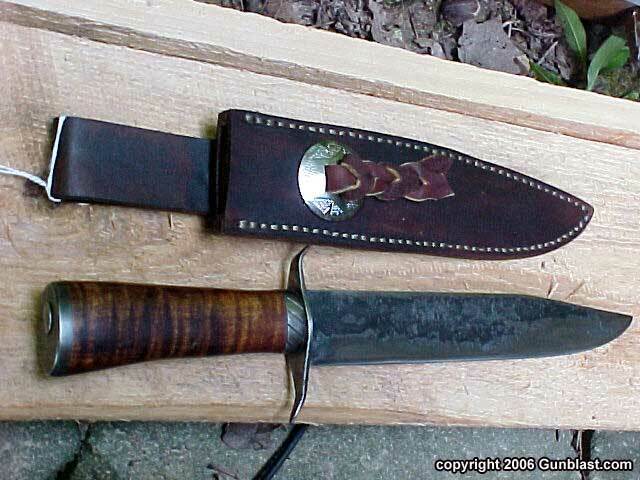 A true custom knife maker, Scott Black can make any type of blade you may desire. 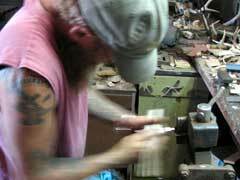 All parts are hand made by Scott, and meticulously detailed. 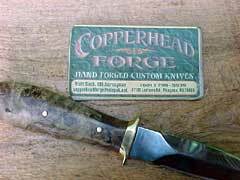 Scott Black's "Copperhead Forge" trademark is a true indicator of quality.